The rickshaw began as a 2-wheeled passenger cart, called a pulled rickshaw generally pulled by one man with one or two passengers. The first known use of the term was in 1887 in Japan. There are three types of rickshaw known as pulled rickshaw, cycle rickshaw and electric rickshaw. Cycle rickshaw is very popular in Bangladesh. It is known as three wheeled passenger cart which is powered by paddling. It carries one or two passenger and sometime on hire basis. After banning pulled rickshaw the cycle rickshaw has becoming popular transport in South Asia. Cycle rickshaw is the most popular transport in all over Bangladesh including capital city. Dhaka is a known as rickshaw city. Around 40000 rickshaws are moving in Dhaka in every day. It looks very beautiful for beautiful painting and colorful paper rapped around the body. A rickshaw looks very beautiful when it is painted around the full body. So the painting is very creative task for a rickshaw maker. The painter paint on back of tin sheet and frame of the body. There are two types of painting in rickshaw one is body painting and another is keyvisual which is painted in tin sheet. The painted tin sheet represents the painter’s choice and designing skill. First the artist make a design object of a rickshaw paint it into the full rickshaw with combination of body and keyvisual. The painting subject could be natural, film poster or religious. There are so many rickshaw artists in Bangladesh. The artist choice and test could be different in different area. 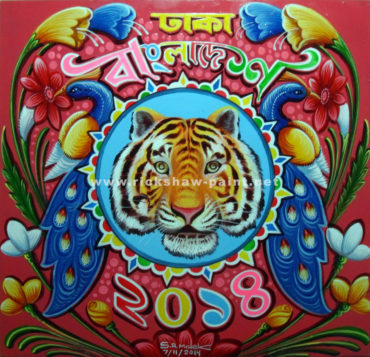 Though enamel painting is popular for rickshaw paints but now a day there are so many designers paint by computerized painting machine and the rickshaw production getting low for government restriction. But still the enamel painting is so much popular in Bangladesh. 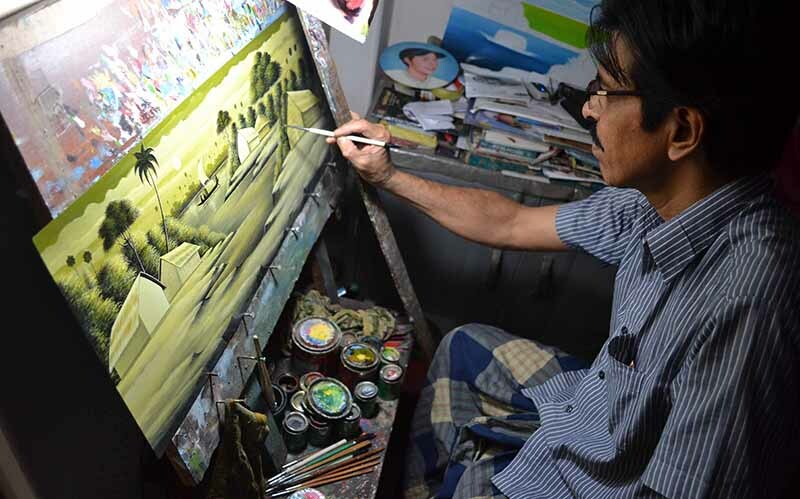 The rickshaw artists also paint in movie poster and wall matte poster. There are 3 generation artists, the first generation was ostad(teacher) they spend their whole life for painting and teaching. The second generation is the follower of first generation they painted thousands of thousand painting with some of their follower and they spend the golden age (1975-1999) for painting in Bangladesh. Now the rickshaw painting is in alarming position for the computerized painting that we mention so the third generation cannot make competition with their talent “as mentioned the second generation artist”.